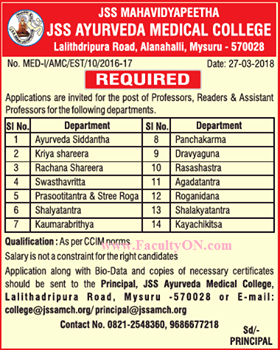 JSS Ayurveda Medical College, Mysuru has advertised in THE TIMES OF INDIA newspaper for the recruitment of Professor/Assistant Professor/Readers job vacancies. Interested and eligible job aspirants are requested to apply by earliest. Check out further more details below. About College: Ayurveda, the ancient diagnostic and treatment method of India is becoming increasingly popular in recent times. A well equipped college to train students in this system was started in 1996-97 by JSSMVP. It is recognized by Indian Medical Council and Rajiv Gandhi University of Health Sciences. It has an intake of 50 students for BAMS course and 13 students for post graduate courses (Rasashastra -04, Dravyaguna 04 and Panchakarma-05).